…but I think I should resurrect this blog! I looked at it when Photobucket had its announce and flounce episode and was greeted with so many Upgrade Your Photobucket Account NOW and pay us hundreds of euros demands (instead of the photos I’d uploaded) that I rather lost heart but I’ve found my files of photo backups and I’m decided I’m off again and posting. I will go back and replace the photos Photobucket has suppressed (unless I pay hundreds of dollars) but I want to post new things too. So here we go. December can be a bit of a blowy month (as well as downright cold and rainy) but we took advantage of a briskly cold but bright day recently and had a tramp around Avranches Jardin des Plantes. Overlooking the Baie de Mont-St-Michel, it suffers from some traffic noise but it is sheltered and there are some interesting plants, sculptures, memorials and trees. The persimmon – or sharon fruit – is called kaki in France which, from a background of Old English slang, doesn’t make it sound the most appealingly named item. I think they’re fairly tasteless (ie, flavour!) but perhaps they’re just delicate and too much garlic has burnt out my ‘delicate’ tastebuds. It was nice to see that the Jardin had thought about its insects with large and varied premises just for them. Whether the bumblebee had booked in for the winter I don’t know (a whole new commercial opportunity for Airbnb perhaps) but I doubt it as they prefer to overwinter in a sheltered hole in a bank or perhaps a crevice in a wall. We’ve had a lot of rain since our visit and I’d like to see how it looks 3 weeks on – it’s definitely a flood plain (hence the very sensible lack of dwellings) and there’ll be a lot of ‘casual water’ lying around by now. A few photos of views and a rather nice picnic table which would be lovely and shady in warmer weather. Does a blog thrive on neglect ? It was a hot and sunny afternoon in early June about 7 years ago. I’d noticed Pepper the dog lying in full sun, looking hot and uncomfortable but intent on something in the long grass. I didn’t think much of it but about an hour later, noticed he was still there, panting hard and he’d been joined by several cats who were also looking down into the grass. Odd. On closer inspection, a small creature sat up on its hind legs and grunted loudly and aggressively at me. The cats backed off, Pepper wagged his tail and I picked up what I assumed was a rabbit and then realised must be a leveret, a baby hare. Young rabbits don’t emerge from the warren until they are well developed and mobile. This feisty little creature was too small and not sufficiently mobile to be a young rabbit so it must be a hare. And I’d picked it up. Having picked it up, I’d transferred my scent to the animal so even if I could figure out from where Pepper had found the leveret (which was not possible) Mama Hare would reject the leveret because it now smelt ‘wrong’. First step was to find out how to keep the animal alive. Google was my – and the leveret’s – friend. I found the wonderful Hare Preservation Trust’s website and also an exceptionally knowledgeable and helpful woman – Susan McClure – who patiently talked me through the first few days. 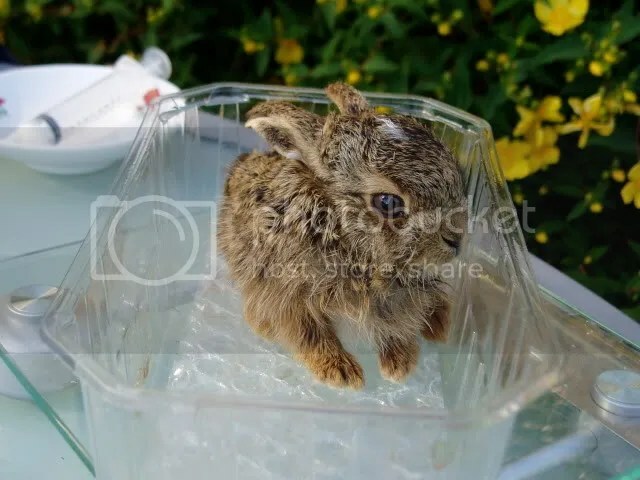 …How to grow a leveret – part 2 to follow in a few days. Well, the past few mornings and evenings, I’ve been out leveret spotting and the good news is… I have no news. There’s been no sign of them and I think their migration from the comparitive safety of the field was due to a herd of young cattle in that field, trampling around them. Patrick is fairly sure that, during the afternoon, the electric fence had been relocated to give the calves a new strip of grazing and that may have interfered with the leverets. I hope they went back, tucked themselves in close to the hedgerow (not ideal but out of the way of bovine feet) and were found and fed by their mother on schedule. …it was a leveret – a young hare. Hares are remarkable creatures. The female gives birth to eyes-open, fully furred, young. She parks them in a field or similarly suitable rough grass where they’ll blend into the foliage and earth colours. Depending on season and availability of food, she’ll give birth to between 2 and 4 leverets and they nestle into the ground, in the open, in all weathers from day one. Mother Hare returns morning and evening to feed the youngsters and the milk bar is open for about a minute before she is loping off again and leaving the leverets to wait until her next visit. They’ll wait through blazing sun, heavy Normandy rain, frosts and even snow. Whereas young rabbits (born hairless and with eyes closed underground in the warren) will try and run away once they are old enough to be above ground, young hares rely on their camoflage to keep them safe. At this age, they try to avoid running – or even moving – they fold their ears back and hunker down in the hope that the danger – the predator – will pass them by. So as I’d established that the one I’d seen was a hare, I drove home to pick up a camera in case they were still there when I got back. They were… two of them (but possibly a third further up the bank at the back of the verge) and judging by their size, they are about 4-5 weeks old. I’d expect them to still be on mother’s milk and am concerned that they were on and adjacent to the road. However, they are big enough to be mobile – though not fast – perhaps they sensed danger in the field (a marten, stoat or weasel?) and decided to move. Or perhaps something has happened to Mother Hare and they were moving in the hope of finding her. The timing, shortly after dusk, certainly fits with feeding time. Well, I can’t know but I am really hoping that these little leverets will survive. I’ll look for them in the morning, of course, but doing the right thing is impossible to gauge. If I touch them, that’s it: as I have to assume they are still being fed milk, I would have to take them and finish raising them to release weight. If I touch them, Mother Hare – if she is still around – will smell my scent on them and will abandon them. I hate these natural world conundrums… life is precarious for these little creatures but interfering if you don’t know the circumstances is not a good idea. If I’d seen a hare dead on the road I’d have no hesitation in making an assumption, scooping up these little creatures and helping them over the next few weeks with ewe replacement milk (richer in fats compared to, say, kitten milk) and then weaning them on to grass and herbs. But if Mother is still doing her thing, they’re better off with mum than going through the shock of adapting to being bottle fed. And if I’m honest, even if they do continue to survive with or without mum, just as they get their legs – the powerful back legs which give them their speed and ability to change direction in a heartbeat – the hunting season will start and if a local gun spots these magical creatures, I can confidently predict the end of several short little lives. I am not against hunting for the pot, but hares are fascinating, secretive animals and their behaviours are not fully understood even now and I’d really rather see them running wild at dawn and dusk than providing a few mouthfuls on a plate. It started about two weeks ago. That irresistible (kidding) sweaty socks scent on the breeze. Yes… the chestnut flowers were out. The flowers really change the look of the tree – from a distance, it looks as if it has been dressed with lemon icing. The lemon male flowers are usually at the top of the clusters, the female being smaller, greener and, somewhat predictably, underneath. We had a lot of hot sun last week and the flowers have quickly been pollinated and begun to turn brown. Some of the spent catkins are beginning to fall and the scent is dissipating daily. Now the hard work starts: the tree has to convert the flowers into ripe fruit over the next few months. The bees – and other pollinating insects – have had a wonderful time. Standing underneath it one afternoon last week, there was no man-made sound at all, just the deafening buzz of the insects amongst the flowers… and the crickets on the hillside. A few years ago, the honey from our hives was very distinctly chestnut flavoured… the bees had a long and sustained period on the trees and the species is available in abundance in this area. It will be interesting to see what sort of crop we get this year – sweet chestnuts apparently produce their best crops after a hard winter and last winter was notoriously mild. On the other hand, it’s been a good and settled year for the flowers to get well-pollinated so on that basis at least, we should be on course for a bumper crop. We’ll see.